Vinegartart is on vacation and has departed from their usual report for a few weeks. 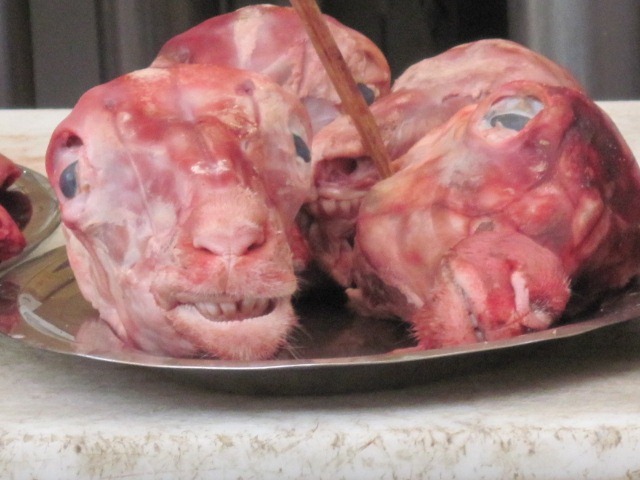 Next week recipes from Sicily but first, this is where their food comes from. 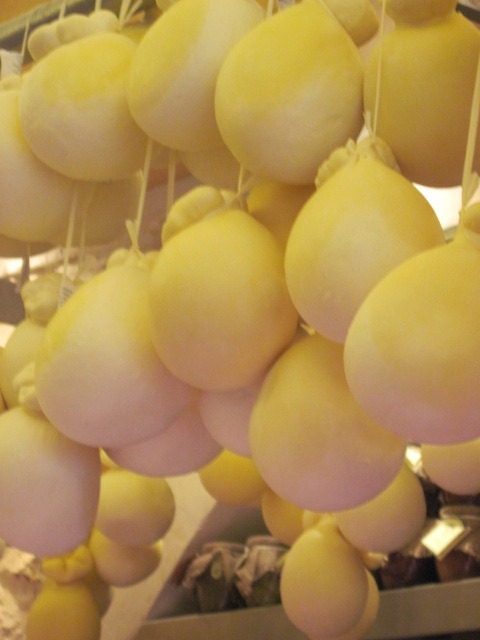 In our previous posts on the food we ate in Sicily, we acknowledged good food, not so good food, rustic food, delicious food, beautifully presented food, plainly presented food. The common denominator was that virtually everything we ate was fresh food. 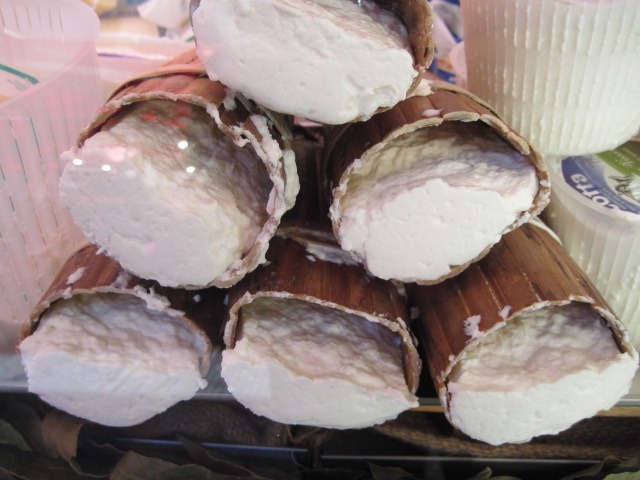 And why not – the fresh food in the markets is fabulous! 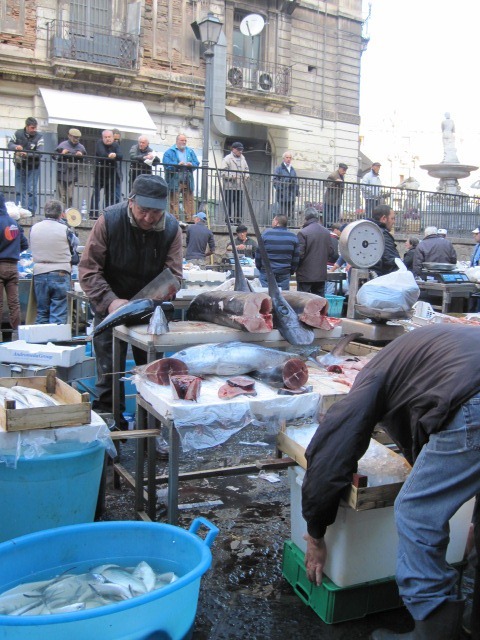 Palermo boasts three markets 6 days a week, Catania one terrific market 6 days a week, and all towns we visited enjoyed regular access to fresh ingredients grown in Sicily or fished from the surrounding Mediterranean. 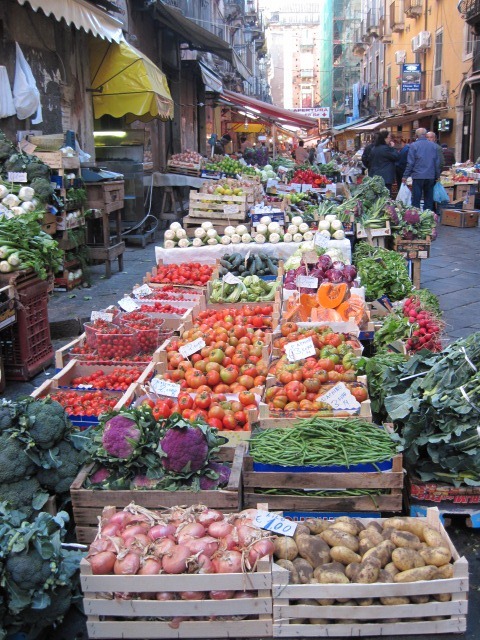 The market in Catania was definitely our favorite with its vast array of fantastic raw ingredients. 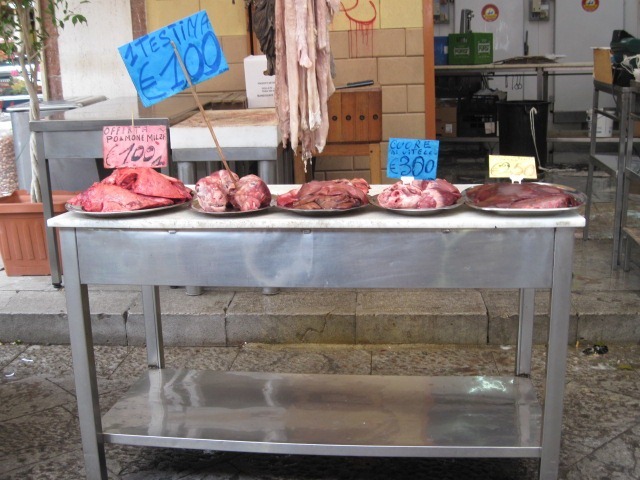 The Sicilians preferred types of meat are pork, lamb and goat although you can also find beef, horse, wild boar, fowl and rabbit. Every and all parts are available to eat; tripe, sweetbreads, spleen, brains, tongue, liver, calf tries (prairie oysters). “Testina” which means “head” can be had for one Euro per. 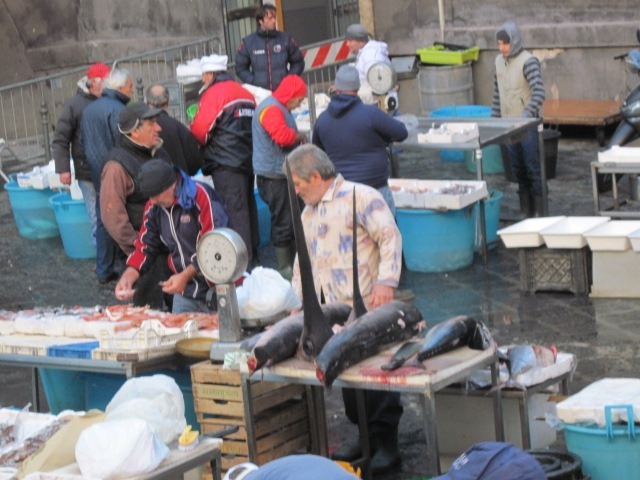 Fish, which dominates the Sicilian menu, also dominated the market stalls and was proudly on display. The sea provides a wide range of tuna, sword fish, squid, shrimp, lobster, mussels, John Dory, cernia, sea urchins and moray eel. The markets were a hubbub of activity amplified by hawking vendors, negotiating consumers and the ever-present motor scooters. 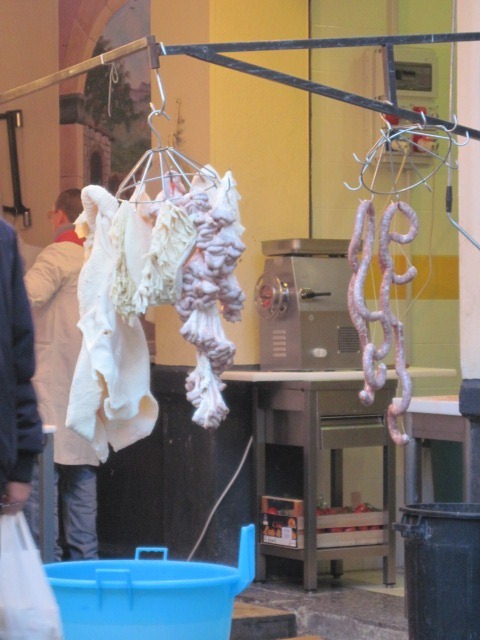 Around every corner a new smell; the air steeped in the aromas of spices, baking, cooking and the unfamiliar. The Cauliflower, Artichoke, Oranges, Lemons, Persimmon and Cactus fruit are all in season in November and stalls featured mountains of these ingredients. Although there appeared to be some effort to preserve freshness through the use of ice and the occasional cooler, it was pretty obvious that the best option for the consumer is to buy early and get it home and in the fridge or cooked fast. We couldn’t help but think that this apparent lack of government regulation probably elevated the quality of the food being offered to a sharper, demanding consumer. Another refreshing Sicilian example of responsibility residing where it should. 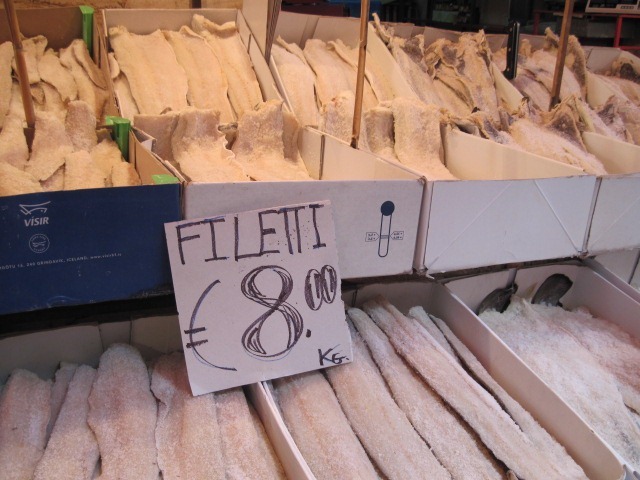 We noticed some interesting signage on a fish stall promoting “Canadian quality” salt cod and wondered if it came from within our 200 mile limit! 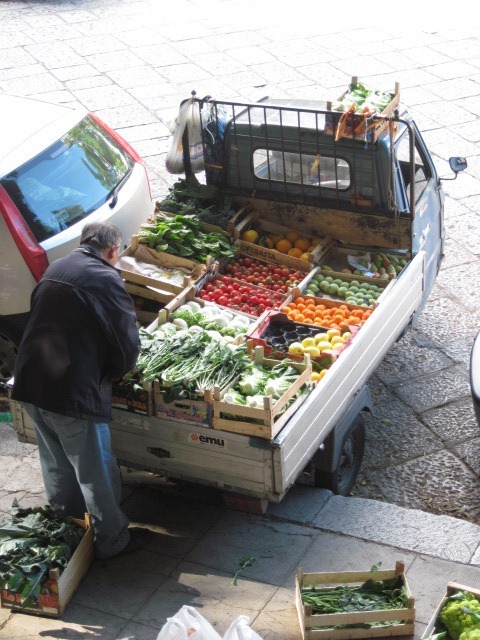 We enjoyed the sight of the occasional street vendor outside the market delivering to a more neighborhood audience. Driving along our route from Palermo to Catania to Noto to Agrigento to Marsala to Trapani, we marveled at the extent to which the countryside was being cultivated with vineyards (they produce more wine than Australia! ), olive groves, artichokes, vast polyhouse acreages of tomatoes with the occasional herd of sheep complete with shepherd. 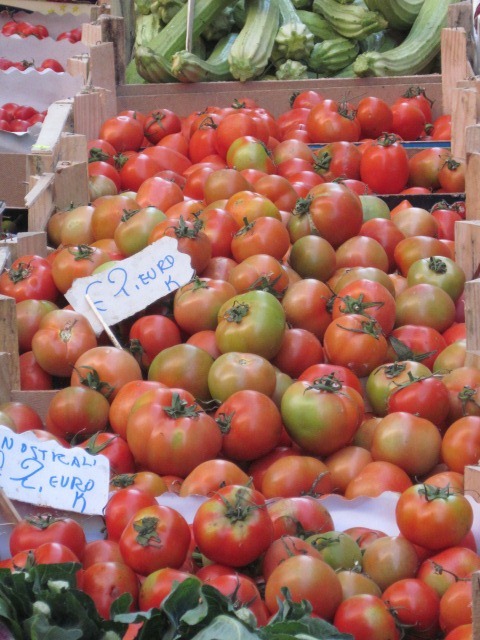 We speculated that this abundance along with the Mediterranean, must ensure the Sicilians the confidence of a truly local food supply. 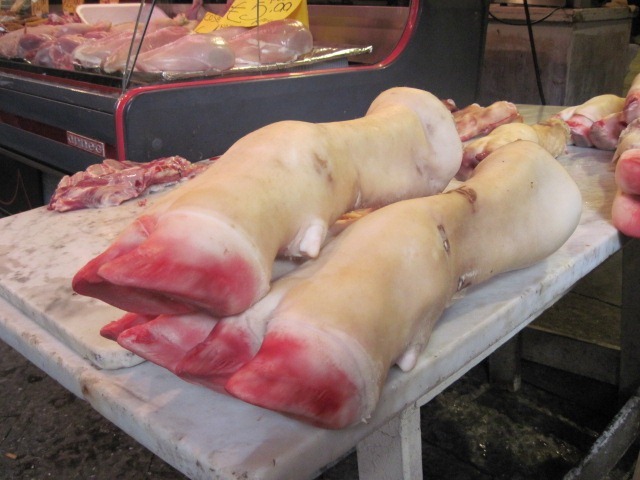 We decided that perhaps this was the outstanding ingredient in Sicily’s food. As our plane lifted off over the salt flats of Marsala and we headed toward the less temperate climes of Amsterdam and Canada, we were thinking local. Next week – back home to Christmas and our vast home vinegar supply!